Computationally Thinking: I saw the light, and it was green. I saw the light, and it was green. Last night I saw a very interesting phenomenon in the sky in Vancouver, BC. A green light that was roughly a rectangle but change shape and position over the evening. This was around 10pm April 15, 2008. Here is a very bad picture. In case you're thinking I'm going all UFO on you, don't worry. 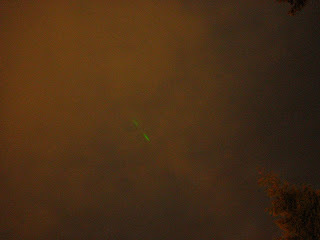 After observing the light for a while it became clear that its some kind of beam with pointed up into the sky. Different parts of the beam became visible at different times, sometimes there were three sections of green light all lined up in a straight line. This is supposedly due to clouds passing in front of the beam and making it visible. It was a very stunning thing to watch and many people on campus were just standing around looking at it. So my question is, what was it? I have heard one theory that it is the result of an adaptive optics beam being used from a telescopic. But this would seem unnecessarily powerful for such a use, and it was very cloudy so why would you test a telescope? Post up here, more pictures also welcome.